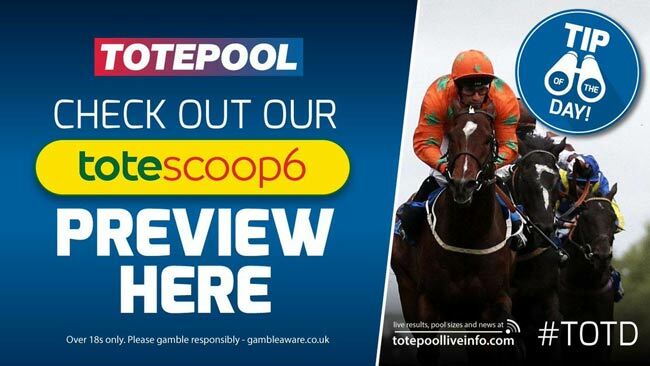 The totescoop6 rolls into Cheltenham on Thursday with a predicted £450k up for grabs in the combined pools. It costs £2 to play and the aim is to pick the winner of all six races. Find here or Cheltenham Scoop6 picks and predictions! 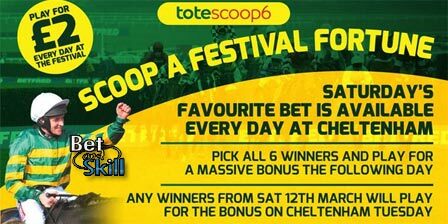 There's over £450k starting in the Scoop6 at Cheltenham. First race off 1:30pm. To win your share of the win fund, you'll need to pick the winner of all six Scoop6 races. If all six of your horses are placed, you'll win your share of the place fund. All win fund winners can register to play for the bonus fund the following day. To win a share of the bonus fund, you'll need to pick the winner of the nominated bonus race as selected by totepool. The totejackpot will run at Cheltenham throughout the festival, with the first six races on the card making up the bet each day. To give yourself a bigger chance of winning, you can perm your selections by picking multiple horses in each race. Remember, the more horses you pick, the more your bet will cost. "Cheltenham Scoop6 predictions and tips. Copy & win the jackpot!"